A common concern I hear about from real estate agents is that they lack basic computer skills. Often times it’s because they’ve come from an industry where they didn’t use a computer. Being able to send e-mails, upload photos, find resources, or type a letter can be discouraging if typing skills are limited to a hunt-and-peck style or computer knowledge is in short supply. Spending an hour to type a four paragraph letter is… uncomfortable… to say the least. But, outsourcing this type of task is highly impractical and can be quite costly. 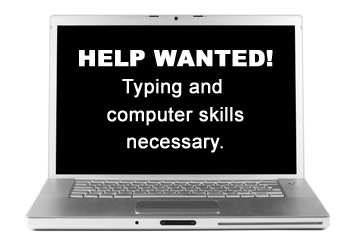 The necessary computer skills required to squeak by in your business are touch typing, basic computer knowledge, and internet research. With these skills much of your day-to-day operations can be streamlined and organized much more easily. The use of technology can greatly enhance your business performance and learning the skills doesn’t have to be hard. All of them require practice and can be done from the comfort of your own home. All you need is your computer and some time. I suggest you start here, because once you can touch type, learning how to use a computer to your best advantage and searching the internet will be a breeze. Train until you’ve reached a typing speed of at least 25 words per minute. This should give you enough skill to manage your business adequately and make your life significantly easier. Here are a couple of options for learning to type at home. The online typing training at Custom Typing Training offers a FREE four-week trial period. After that the cost is only $9 per month payable in two month increments. If you can practice enough during the trial period to get up to speed, you will owe nothing. Just cancel the subscription before your trial period is over. Of course, if you want to type faster, you can maintain your membership as long as you like continuing to practice until you get to the speed that you are satisfied with. If you want to purchase software instead of studying all online, I used Mavis Beacon Teaches Typing to improve my typing skills. I went from typing 28 words per minute to 70! That’s an improvement of 150% and I had fun doing it! Learning to use your computer operating system, Microsoft Outlook, Word, and Excel are the most common necessities for your business. These are by far the most frequently used software programs besides the real estate specific programs you might use. You can learn your operating system and popular software titles all from one resource. VTC Online University offers incredible online training opportunities for an enormous variety of popular software programs including both Mac and Microsoft operating systems. The biggest advantage I’ve found from using this site is that the programs are systematically broken down into modules that contain small lesson segments. Each segment discusses a different aspect of the module to help you use the software. You can either go through each module’s lesson segments in succession to learn the subject completely or go directly to a specific topic that you need to learn about immediately. There are no requirements on how you use this training. Check out a sampling of the training lesson segments for FREE. Find a program that you want to learn about and click on any of the lesson segments that have a red dot on the left. The shaded lesson segments are only available by becoming a member. For only $30 per month or $250 per year (a savings of $110), you will have unlimited access to ALL of the programs in their collection and can cancel at any time. This subscription is well worth the investment!